More than 100 people gathered in Berkeley, California on October 16, 2016 to help me celebrate the publication of Structured Negotiation, a Winning Alternative to Lawsuits. The atrium at the beautiful Ed Roberts Campus was a perfect place for the party. 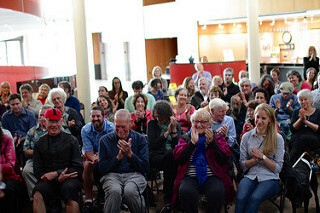 Blind activists who have helped Structured Negotiation flourish as a way to resolve legal claims without lawsuits, members of the local disability community, and friends and colleagues from so many strands of my life turned out to celebrate the book despite the first big rain of the season. Thank you all! Structured Negotiation is a book about resolving legal claims without the expense and conflict that typically accompany filing a case in court. It provides readers a detailed yet easy-to-read road map through the process, from the first letter to implementing a workable settlement agreement. And it does so with stories of two decades of Structured Negotiation success in the field of digital accessibility and disability rights. At the launch party, some of those successes took the form of cakes and other sweets. Pictured here is a tactile keypad cake, replete with a telephone keypad, raised dot on the five key, and a raised circle on the green-frosting enter key. Structured Negotiation led to agreements with a dozen national retailers that replaced flat screen point of sale devices with tactile keys that could be seen and felt. The keypads (though not the cake) allowed blind people to confidentially and privately enter their PIN. More book-themed desserts below. Structured Negotiation has been used with great success by the blind community across the United States for twenty years. Walmart, Bank of America, CVS, Anthem, Inc., the City and County of San Francisco and dozens of other organizations have traded the negativity of lawsuits for the cooperation of Structured Negotiation. The book is full of stories of win-win resolutions with these organizations and others on issues including accessible websites, Talking ATMs, accessible mobile apps and more. Many of the blind advocates involved in Structured Negotiation initiatives were at the book launch. Their presence made it easy for me to talk about how relationships are at the root of the most effective Structured Negotiations. Kit Lau who spearheaded the negotiation with Charles Schwab was there. And so was Rio Popper and her parents, the family whose advocacy for audio description launched a successful Structured Negotiation with Cinemark. Jerry Kuns and Kathy Martinez, two of the first Talking ATM claimants helped shape the alternative dispute resolution process; it was fitting they were there to celebrate 20 years later. Lucy Greco, involved in several Structured Negotiation initiatives, web accessibility evangelist, and baker extraordinaire, made a beautiful toast. Linda Dardarian, the lawyer who pioneered Structured Negotiation with me, had a front row seat and spoke eloquently about the important role clients play in the process. A litigator as well as a Structured Negotiator, Linda talk about the difference between resolving legal claims with battles and distrust, and resolving them with cooperation and trust. Linda’s firm Goldstein, Borgen, Dardarian and Ho has been crucial to the success of Structured Negotiation and party to so many of the stories in the book. Long-time firm partner Barry Goldstein, who had the original idea of working outside the courthouse, was also at the launch. A highlight of the book launch celebration was the book-themed dessert table, shown at left. Fortune cookies with braille messages were piled high courtesy of the California School of the Blind student-operated company . Hexagon-shaped cookies (to match the book cover design) were decorated with candy dots spelling out letters in braille. (LF for my initials, LG for Lucy Greco’s initials – we baked the cookies before the party!) Others had one chocolate chip in the center to represent the raised dot on a tactile keypad. Gluten free yummy coconut-honey macaroons were baked by My Berkeley Kitchen, the honey representing the bee-hive like hexagons on the book cover. Chocolate and white swirled butter cookies symbolized disparate flavors coming together to make a delicious whole — in the way Structured Negotiation brings parties together for a win-win solution to legal claims. Cathie Skivers, long-time president of the California Council of the Blind (CCB) and organizer extraordinaire, wasn’t able to attend the launch, but sent a message saying “It would be such fun to see the cakes that mark such special times in Lainey’s life and CCB’s.” I will never forget working with Cathie through the early Talking ATM cases with the help of a mediator. Cathie told him that she herself would never use a Talking ATM, but she was fighting for them because that is what her membership wanted. Her honesty and commitment were an important reason early Structured Negotiations with the nation’s banks were successful. In the book you can read about 20 years of Structured Negotiation successes like the early Talking ATMs — with Major League Baseball, Walmart, and so many others. But you’ll have to do so without the themed cakes — haven’t yet figured out how to put them into a book! **Thanks to Dave Nold for the pictures in this post. Thanks to Dmitri Belser of the Center for Accessible Technology (CforAT) for hosting me at the Ed Roberts Campus. This is a post about the party to celebrate Lainey’s book. More than 100 people came. The book is called Structured Negotiation, a Winning Alternative to Lawsuits. It is about twenty years of disability rights advocacy without lawsuits. At the party the desserts were all related to themes in the book. There was a cake decorated like a Talking ATM. Another cake was decorated like an accessible pedestrian signal. Cookies were in the shape of a six-sided hexagon to match the background of the book cover.